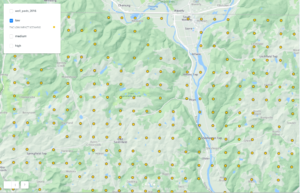 The SkyTruth app that maps potential drillout scenarios across the landscape of Allegheny County, PA has officially received its first update! In an effort to make the experience more user-friendly, explanatory text and tips have been added. 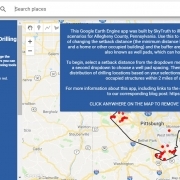 Our app has also been updated to remove from the drillout scenario areas such as major highways and the Pittsburgh International Airport, where drilling would obviously not take place. A screenshot of the app when first initialized. At the request of some users, we’ve also tabulated the results for the potential drillout scenarios by municipality. See the results in this table showing the number of occupied structures within two miles of a hypothetical drilling site, based on a given setback distance (in feet) and drilling site spacing (in acres), for every township and borough. 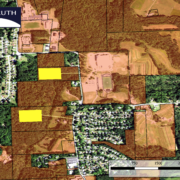 We were also asked to calculate the number of occupied structures located within 500 feet, and within two miles, of existing Marcellus Shale drilling and fracking sites. 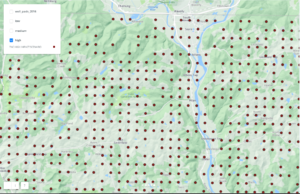 According to our analysis, 78 occupied structures fall within 500 feet of an active drilling site in Allegheny County and 67,673 occupied structures sit within two miles of an active drilling site. Recent scientific research has found human health impacts for people living within 2 miles of a drilling site. Be sure to check out these insightful new updates for yourself. Give the app a try and let us know what you think by contacting Brendan at info@skytruth.org with any feedback you might have! Up to this point, Allegheny County in southwestern Pennsylvania has been mostly spared from much of the fracking boom spanning that state. This may change however, as oil and gas companies have been systematically leasing property around the county for potential drilling. Usually it’s hard to get a handle on the magnitude of this threat, since leases on private property are generally difficult to discover. 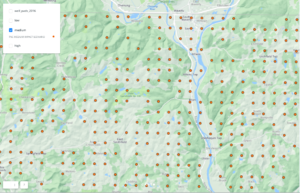 Fortunately for the public (us included), our friends at FracTracker Alliance built the Allegheny Lease Mapping Project: an interactive online map showing land parcels leased or contracted to oil and gas companies. Individual parcels of land that have been tied to oil and gas records can be selected to pull up a variety of information about that parcel. Users can explore the map to see where a parcel of leased land is located relative to homes, schools, bodies of water, parks, and other sites of interest. This tool is meant to help citizens, communities and policymakers make informed decisions about zoning, land use, and future oil and gas development in the region. Active leases (green) in Allegheny County, PA. 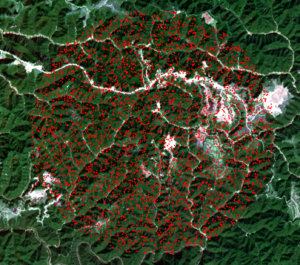 Active leases that have experienced some drilling activity since 2005 shown in red. Click to enlarge. A portion of northeastern Allegheny County showing active oil and gas leases in orange that have not yet been drilled, in an area of mixed residential, forest, and agricultural land use. Hypothetical drilling sites (“well pads”) and access roads are shown in yellow. Click to enlarge. 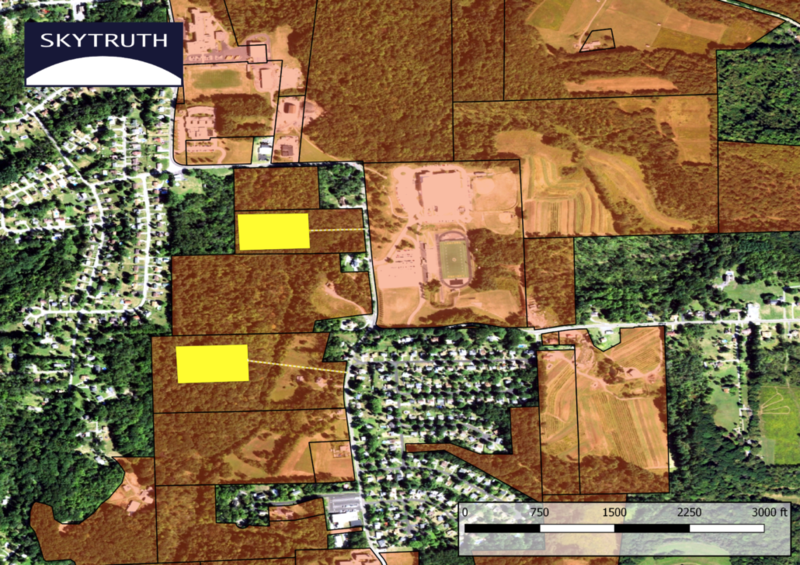 Detail from above, showing potential proximity of large industrial drilling sites to homes and a school. Click to enlarge. In the close up above, we see that a potential well pad of typical size dwarfs the high school and football field only 1200 ft away. During drilling the neighborhoods nearby would have to cope with health, safety and lifestyle impacts associated with round-the-clock noise, heavy truck traffic, and degraded air quality, in addition to the longer-term potential for surface and ground water contamination caused by accidental leaks and spills. It’s our hope that by making this hard-to-access leasing data easily available, folks in Allegheny County will be enabled and inspired to take action to protect their communities. 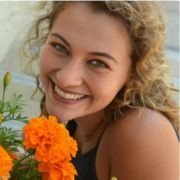 A big tip ‘o the hat to FracTracker for building and sharing the lease dataset.